The task seems to be figuring out cards that are good with Wilderness Reclamation. The card looks to be a slam dunk. We’ll walk through some basics on this card, then get to some of the historical comparisons. Let’s start with Growth Spiral. Growth Spiral allows you to play Wilderness Reclamation on turn three. That’s great by itself. 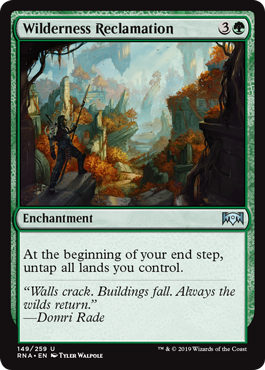 You can’t normally just tap out for a four mana do-nothing and expect to live through the next few turns, but Wilderness Reclamation will untap your lands on your own end step. Depending on your other colors, you will be able to defend yourself with anything from Fog variants to Settle the Wreckage for the turn. Turn five (or turn four with Growth Spiral) starts getting really interesting. You can open up by playing Teferi, Hero of Dominaria. You do the whole “draw a card” thing with Teferi, then move to your end step. Teferi will untap two lands. Wilderness Reclamation will tap all five. Put one effect on the stack, tap Teferi’s bounty in response, and you’ll have access to seven. You know: For Nexus of Fate. “Yes,” replies the Hand of Fate. You don’t even have to play Teferi, or white at all. This card works just fine and dandy with Nexus of Fate with or without Teferi, and untapping all your lands every turn is hyper synergistic with Search for Azcanta. How Might We Properly Gauge Wilderness Reclamation? One of the things that’s great about this card is that, in addition to being able to spitball a cool two-three-four sequence with Teferis and Time Walks… We can just compare it to things we know have already performed. Compare it to Thran Dynamo. Thran Dynamo cost four mana and gave you three back immediately. Presuming your mana is all coming from lands, Wilderness Reclamation is generally — and immediately — just better. Rather than colorless mana, you get colored mana back. Rather than just three, you get four (or more). Even better, you get more and more mana over time assuming you hit your land drops. Ditto on Gilded Lotus. Rather than paying five up front, you only have to pay four. Again, Wilderness Reclamation will generally give you more mana than the celebrated Lotus; and pay you more and more mana over time. I, for one, look forward to post-ban Standard. Basilica Bell-Haunt – Mike comes completely around on this card. Patrick has him comparing it to Loxodon Hierarch and Siege Rhino. Synergies with The Eldest Reborn push the Bell-Haunt over the finish line. Shimmer of Possibility – Impulse at sorcery speed… Not great but good at finding Wilderness Reclamation! Pteramander – Solid deal for one mana. Lots more in the podcast proper. Give it a listen!